Do you want to know How prevent misuse of Aadhaar card? In this tutorial, you will know How to stop misuse of Aadhaar Card and How to be safe from Aadhaar fraud. Here I will provide you with simple steps to protect yourself from any fraud. It’s simple and easy to secure your Aadhar card. If you have lost it, it’s ok. You can still apply these things to make your Aadhaar fully secured. Follow this guide till ends and know unique things about Aadhar card. For which services is Aadhaar mandatory? General awareness about Aadhaar card is necessary. You should know where to share Aadhar details directly or not. As per the Supreme Court verdict, Aadhar is not mandatory for school admissions, in UGC and CBSE exams and many other services like obtaining SIM card or opening Bank accounts etc. If you don’t want to share your Aadhaar number directly. Note: private firms, unofficial websites, rail and movie tickets and any other online non-government authority cannot ask for biometric and Aadhaar number for their services. Now there can be different ways and method which fraudsters can do apply to grab you in their net. Do not share your Aadhar number and bank details with any random person on phone call. It is also compulsory to link Aadhaar to a person’s permanent account number (PAN). Aadhar is still mandatory for central and state government welfare schemes and subsidies. For the filing of income-tax returns. Now you can lock and unlock Aadhaar biometrics information to protect the privacy of your biometric data. UIDAI provides a system to lock and unlock your Aadhaar biometric information. 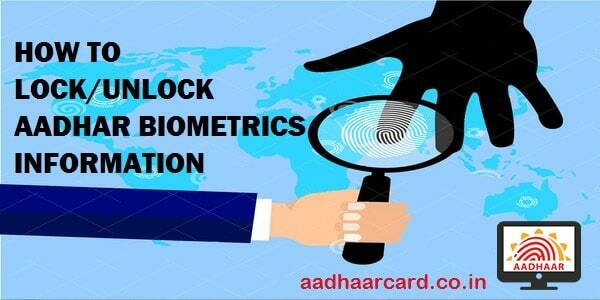 Biometric information refers to the iris, fingerprints and facial photograph of Aadhar holder. New Aadhaar Biometric locking system enables users to lock/unlocking their biometrics so that no can misuse their Aadhaar biometrics data. Locking and unlocking of Aadhaar can be completed in a few minutes. But, you require your registered Mobile Number to use this service. In case your mobile is not registered with the Aadhaar card – visit the nearest Aadhaar Enrolment centre. A step-by-step guide to locking/unlocking Aadhaar Biometric data. Do you want to track you Aadhar usage history? The Unique Identification Authority of India (UIDAI) allows you to track your Aadhar usage history of the past six months. The UIDAI available the option for retrieving the history of Aadhaar card usage. You can now visit the UIDAI’s official website, and easily track the history of your Aadhaar card. This will help you to know your Aadhaar card usage history. A step-by-step guide to help you track Aadhar usage history details. At present, there is no clear-cut option available for delinking Aadhaar with respective services. However, you may call up the customer care number of the service provider or email them to place a request for delinking. Then you will receive an email from the customer care service asking for a soft copy of the Aadhaar card to be delinked. Once the copy is sent to the service provider, then Aadhar will be delinked within 72 hours.